Here’s an update from last year’s post regarding my setup. 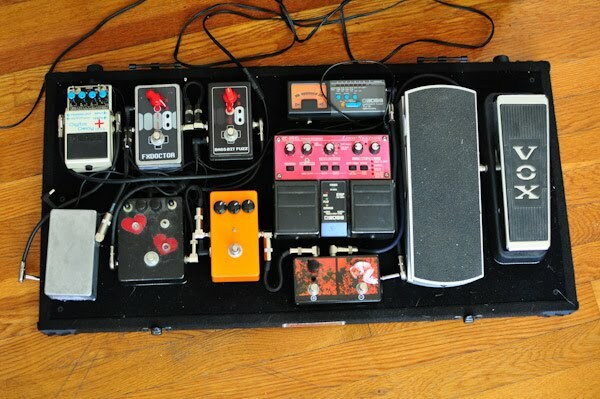 I finally picked up “The Pedalhead” from NYC Pedalboards so here’s the new layout. I’ll substitute in a Metatron for the Heart Fuzz or RC-20XL depending on what band I’m playing with. I’ll build a mini patchbay and use it as a riser for the TU-12 at some point. All powered using a daisy chain and a Visual Sounds power adapter. I’ve used a Dunlop DC Brick in the past but wasn’t impressed so switched back to a daisy chain. This entry was posted in Gear Related and tagged NYC Pedalboards. Bookmark the permalink.